The Hofbräuhaus brewery is located in Munich Germany and was originally built in 1589, it was however not opened to the public until 1828. The building was completely renovated in 1897 when the brewery moved to the suburbs of Munich, however during World War 2 the brewery was destroyed from bombing, all that remained was the historic beer hall. 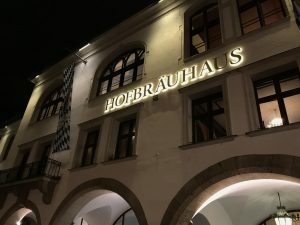 The Hofbräuhaus was then reopened in 1958 to and has been open to the public ever since. The Hofbräuhaus originates from Wilhelm V. duke of Bavaria, he found the beer in Munich so bad that he imported beer from Saxony. Wilhelm eventually asked his royal court to find a solution and thus they built their own brewery in Munich. Other then Oktoberfest the Hofbräuhaus is Munich’s largest attraction. As a whole we were lucky enough to have dinner there. The meal we had consisted of pretzels, bread with cheese dips, two types of pork, potato balls, and mixed berries on top whipped creme for dessert. 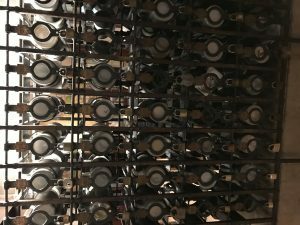 The Hofbräuhaus has stein lockers for the local members, they are able to leave their steins in their locked locker until they next return for drinks. The Hofbräuhaus also has assigned tables for these members, the only way you’re able to sit at the members table is to be invited to the table by the members. Brian D. Cawley on Hello world!